At Best Bride, we believe in the love and sanctity of marriage. We also believe that two people in love should have the opportunity to marry their soul mates, despite their economic challenges. For this reason, three times a year, Best Bride provides wedding planning services free of charge to couples whose stories inspire us. We hope you find our efforts worthy of your support and we look forward to sharing these extraordinary events with you. 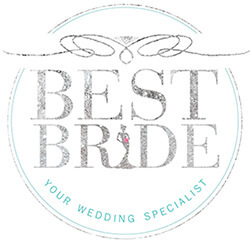 Our Founder Leora has created some of the most beautiful weddings over the last 5 years at Best Bride. Through her encounters with couples of all cultures and religious backgrounds, she began envisioning a program that would provide assistance to those who deserved a bit of luck, love, and bliss. 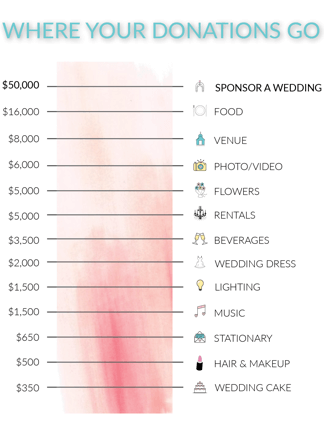 Wish for Bliss is a Best Bride project designed to excel through donations and sponsors. The selection process is unbiased and open to all couples regardless of race, age and religion. With the help from wedding and event industry professionals, Wish for Bliss will help selected couples celebrate their love with elegance and ease. Every dollar can help make Wish for Bliss weddings come true! Whether you are an individual, family, or corporation, all contributions are valued and appreciated by the couple and the Best Bride team. For other forms of payment, please contact our office. Thank you for your interest in helping us make a difference through Wish for Bliss. This project depends on you, the wedding professionals who are willing to give their services. The vendors needed include, but are not limited to the following: photographer, videographer, florists, DJs, musicians, catering, rabbis, officiant, rental companies, bakeries, hair and makeup artists, bridal stores and even venues. All help is appreciated and we would love to collaborate with like-minded businesses to minimize the outside costs of these services and make these wedding Wishes come true. We are excited to begin this journey together and always look forward to working with amazing professionals in the wedding industry. We are proud to collaborate with companies who are passionate about creating memorable events! If you would love to help but are not a part of the wedding business, or are not able to provide your services, please consider a donation to this wonderful cause.